Soering has been behind bars for 27 years, but in certain circles there are persistent doubts, and his story remains in the news. In part one of our series, Sandy Hausman looks back at the case. Ricky Gardner was a newly minted detective with the Bedford County Sheriff’s office. Today, 28 years later, he pages through a notebook of photos from the crime scene. For months, they traveled in Asia and Europe before being arrested for check fraud in England. When questioned about the murders, Jens – the son of a German diplomat -- said he committed the crime, because the Haysoms disapproved of his relationship with Elizabeth. But another story would emerge before his trial began. Gail Starling Marshall was a deputy attorney general in Virginia from 1986 to 1994. She says Germany is more lenient when it comes to crimes committed by young people, and there’s greater emphasis on rehabilitation. Teenaged killers can be released after only a decade, and Soering said he would gladly spend ten years behind bars to save his first lover from the electric chair. When Jens and Elizabeth were caught in England, he admitted the crime. Details of his confession, a diagram he drew of the crime scene, the manner in which the Haysoms' throats were cut, corresponded closely with what police had found. He was not, in fact, entitled to diplomatic protection, because his father worked at the consulate in Detroit, not the embassy in Washington. And so, in 1990, he was tried and convicted – getting two life sentences for the crime. But Marshall, who handled one of his appeals, continues to assert his innocence, and in our next report we’ll tell you why many Germans want Soering freed. From the beginning, there was no physical evidence to prove Jens Soering killed Derek and Nancy Haysom, the parents of his girlfriend Elizabeth. Recent tests on 42 pieces of evidence from the crime scene found no DNA from Soering. And when the Chief Detective, Ricky Gardner, looked for blood in the car Jens allegedly drove, he found none. "We did a luminal of the car. Luminal reacts to dried blood or invisible blood, and there was no sign of any blood in the car. Had there been just a minute spot of blood or whatever, the luminal would have still showed up for that." Soering offered a simple explanation: Elizabeth committed the crime with help from another man and another vehicle. In 2011 the owner of a Bedford County transmission shop – Tony Buchanan – came forward to tell of a car dropped off at his shop shortly after the Haysom murders. When he got to work on Monday, he called the towing company. He holds an article about the Haysom murders, with a photo of Elizabeth. Buchanan says she is definitely the woman who retrieved the car. He remembers her, because it took a while for her credit card payment to clear. But the other person pictured in that newspaper article – Jens Soering – looked nothing like the man who had accompanied the woman who picked up the car. Buchanan figured police had the matter under control, but years later he learned that Elizabeth’s uncle lived in Florida, and he thought maybe he should report what he’d seen. Buchanan claims he called Detective Gardner, but Gardner says he didn’t get the message and doubts the story. Nor does he worry about a fingerprint found on a glass at the crime scene – a print that has never been identified. His supporters believe such details should lead to a new investigation – or maybe a new trial for Soering, but Virginia has something called the 21-day rule. With the exception of evidence that clearly proves innocence – like DNA -- new information can only be considered if it’s submitted within 21 days of a conviction. Gail Marshall is a former deputy attorney general who reviewed the case for the Soering family and filed an appeal. In our next report, we’ll look at efforts by Germans and Americans to have Soering paroled and tell you why that could happen soon. The Virginia Parole Board has, again, refused to release Jens Soering, a former honors student from the University of Virginia, convicted of killing his girlfriend Elizabeth Haysom’s parents with a knife. She is also behind bars as an accomplice to the gruesome crime. Both have been model prisoners, and both are eligible for parole or a pardon from the governor. Pressure from Soering’s homeland, Germany, is building, and some prominent people here in Virginia question his guilt. She and a friend, actress Anna Utzerath, come to Virginia yearly to meet with Soering and his supporters. In Germany, they founded a group called Friends of Jens, organizing online. He now has 4,000 friends on Facebook, and about 3,000 people have written to President Obama, Chancellor Angela Merkel and other officials who could arrange for Soering to be sent back to Germany. A prominent intellectual once imprisoned in East Germany has joined the cause. Dr. Wolfgang Welsch questions a previous parole board claim that the community would be endangered if Jens were released. This week, when it denied Seoring parole, the board did not mention risk to the community – although it did suggest release of Elizabeth Haysom might be a danger to the public. The Soering case has received tremendous media attention in Germany, has inspired a stage play, and next year, German theaters will screen The Promise -- a documentary on the subject. Co-producer Karin Steinberger says there were many mistakes in Jens’ original confession. It had Mr. Haysom’s body in the dining room, when – in fact – it was in the living room, and Soering said Mrs. Haysom was wearing jeans, when she wore a blue and paisley robe. WVTF and RadioIQ tried to verify that claim, digging through a chaotic collection of evidence at the Bedford County Courthouse. Legal documents, reports on body fluids, photographs of the crime scene and love letters were randomly stored in cardboard boxes, bags and envelopes. When we came across several cassette tapes which likely contained Soering’s confession, the county clerk – Cathy Hogan -- refused to let us hear them, arguing they might break. Former Deputy Attorney General Gail Marshall believes Bedford County is still protecting the prominent Haysom family, and jurors from neighboring Amherst County were doing so when they convicted a young German student of a crime he may not have committed. "The people in Bedford had a choice between deciding whether it was one of their own or whether it was a foreigner. Given the choice, you’d much rather find it was a stranger than your own child. " On the other hand, she points out that Elizabeth was an admitted drug user who wrote letters attacking her parents and wishing them dead. Marshall’s arguments persuaded Tom Elliott, a deacon in the Catholic archdiocese of Washington, DC. 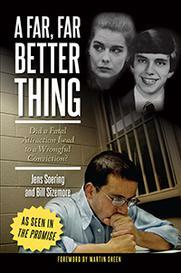 He’s known prison inmate Jens Soering since 2005, and cannot see him at the crime scene. In our final report, we’ll look at diplomatic efforts to get Soering out of the Buckingham Correctional Center, and tell you why politics in Virginia could lead to parole. When German Chancellor Angela Merkel met with President Obama earlier this year, constituents asked her to raise the subject of extradition for Jens Soering. 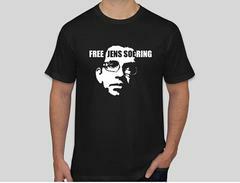 While he was convicted by a jury in Virginia, plenty of people in Germany think Soering is innocent. Among them, Anna Utzerath, who helped found a group called Friends of Jens. As governor, Democrat Tim Kaine was willing to transfer Soering to Germany at the request of the Obama administration – arguing the German prison system should pay the price of keeping him locked up, but Attorney General Ken Cuccinelli attacked the decision in an interview with NBC TV in Richmond. In fact, the Haysoms had nothing to do with UVA, but Cuccinelli pressed on – scoffing at a German promise to keep Soering in custody for at least two more years. German lawmaker Christoph Straesser says Jens had already served more than twenty years, and in his country, which puts greater emphasis on rehabilitation than retribution, that may be long enough. In his time behind bars, Soering has not broken a single rule. He’s published nine books on theology and prison reform, but he had no hope that a parole board appointed by Governor McDonnell would release him. For Soering and his supporters, that is a campaign issue. We asked campaign staffers to find out if Terry McAuliffe and Ken Cuccinelli would favor parole for Soering but received no response. Based on his past remarks, Cuccinelli would not, but McAuliffe might, and he would have a chance to appoint a new parole board – one that could be more lenient. President Obama – anxious to repair damaged relations with Germany – might ask Virginia again to send Soering back. If that happens, you can expect the man who helped put Jens Soering away, Bedford County Detective Ricky Gardner, to be furious. That said, a more liberal parole board might also look at Elizabeth Haysom’s clean record in prison and opt to release her too.